This book contains several effective formulas with many examples of each formula that you can use or modify. Once we know how the formulas work, we can create unlimited Ice Breakers on-demand to use and pass on to our downline. Your distributors will no longer be afraid of prospecting; instead, they will love prospecting. It is much more fun when we are in control. Distributors want to work hard, but just don't know what to say. Their opening random remarks ruin their chances and they suffer bad experiences. That experience trains them to avoid prospecting. With trained words and phrases, everything changes. Quick and positive results. Prospecting is fun again. 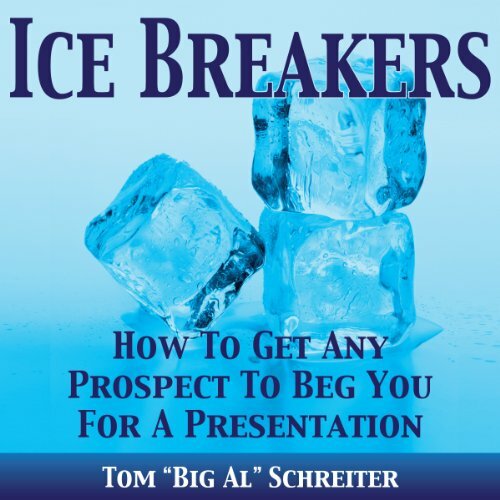 Enjoy learning how to prospect negative people, positive people, relatives, co-workers, strangers, leads, cold prospects....anyone, by using fun Ice Breakers that even the prospects enjoy. 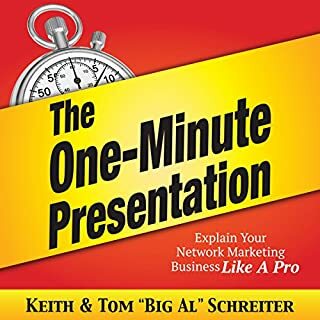 So if you need more prospects, if you need to give more presentations, then this is the book for you. Spend the entire week giving presentations, instead of spending the entire week looking for someone to talk to. And never again will you have to hear one of your distributors complain, "I just don't have anyone to talk to." This was very relevant not only for MLMs, but is a great way to develop social skills. The techniques are very applicable and I will practice them daily to make it a habit. This is great material for anyone who is looking to prospect. stark difference to the first book I read! This was the second book that I got from Big Al. had I bought this book first, I would never buy a big Al book again. surprisingly, this book is so much different than the first. The first book was about telling stories and it was an excellent book that I rated 5 stars. however, in this book he spends chapter after chapter after chapter telling you about the very same icebreaker. then, he plays out the most unrealistic scenarios as though that is how people actually react in their everyday lives. I pushed through to about chapter 13 before I just had enough of him telling me things that simply are not true. I am just blown away but how completely different the two books are. Would you listen to Ice Breakers! How To Get Any Prospect To Beg You For A Presentation again? Why? I plan on listening to Ice Breakers over and over again because it was surprisingly funny and valuable. The narrator was the star of this Audio Book, who did a great job on bringing life to the book. I find other audio book narrators to give a monotone feel much like the Clear Eyes guy commercial, "WoW!" But this book was refreshingly funny and kept me hooked to the end, I never got into a trans which I sometimes do with other narrators Clear Eyes voices. 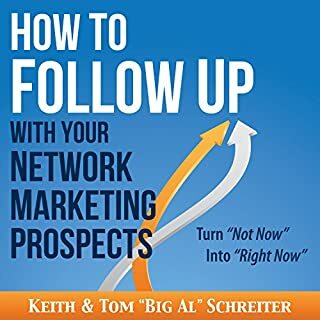 My favorite part of the book was when he shows you how to apply a technique of asking your prospect if they would like to do something about it, and to figure out the tell tale signs of them saying no without using the word "no" and how to escape from the excessive ramble of an excuse driven society. The comedy and the fact that I could compare and see myself going through a lot of scenarios discussed in the book. I started applying the techniques right after I listened to it and it was like the twilight zone, because everything that was taught I applied and boy does it work. Omgosh! Soooo simple and full Great examples!!! I'm embarrassed that I didn't think of these things to say. I've been making it way too complicated... "Big Al" shows us that we need to make other people the focus!! GENIUS!!! I will definitely be using these ice breaker suggestions on my new prospects! 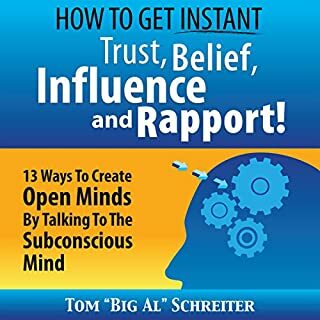 I definitely recommend this for those people who just are not comfortable with sales. "Beg" might be a bit of an exaggeration, but good solid tips for people who rely on meeting and talking with others to make a living. This training is perfect for introverts. It levels the playing field for people like me. straight forward and no dry, drab talk. this is a very good read for introverted ppl and not just for network marketing. Great book for beginners, or for anyone who is introverted or shy. Lots of practical examples. One donkey trick that goes on for way too long. May have worked in Glengarry Close. What a waste of time nowadays. loved it. these ideas will be really helpful can't wait for my next network event to test.these suggestions. 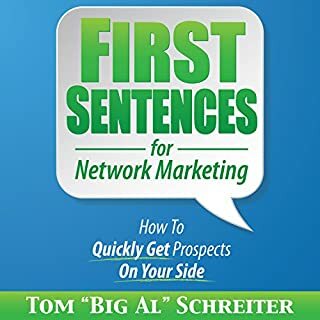 A good introduction to how to introduce yourself to new prospects, some can sound a little formulaic but the proof is in the pudding. amazed. now just need to go and try all the sentences out. I am sure they will work. Probably worst audiobook I have in library. The author's favourite author is himself! Nothing wrong with that but I pity him because this audiobook is total nonsense. I'd request a refund but it was cheap to buy so I'll just leave it. I should have paid more attention to the other reviews before purchasing. Very good book. The author had lots of enthusiasm and told the stories really well. Great insight mixed with good humour. loved this book. straight to the point and amazing tips! love the fact the book isn't hours long! highly recommended!! If you do sales, any kind of sales. I highly recommend this book. A lot of good information with no boring fill. I am not going to harass every cashier I purchase a battery or pancakes from and they are not going to throw themselves on every get-rich-quick scheme you vaguely mention ! What a crock ! Some fantastic tips in this book. Awesome tips in this book. I learnt a lot from it,. It is very helpful! I loved all the examples that were given. This audio was easy and interesting to listen to. I found myself laughing out loud a few times as well. Definitely recommend it. some great ideas and tips, will listen to it again as there's plenty to take in. Short, simple and easy to understand. A great book displaying Big Al's vast experience and knowledge in applying proven ice breaking techniques. a must read for anyone looking to improve their conversational skills in general. really worth the money & time. 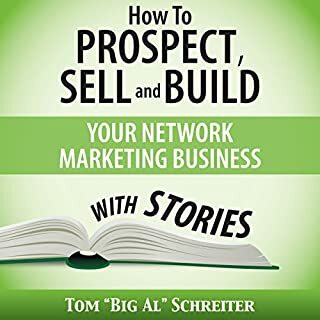 if you want to be successful with network marketing then listen to this gem. 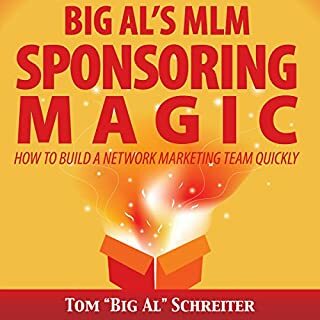 Just a couple of hours of a network marketer telling you all his tricks of the trade. Found it soooo annoying listening to him going through all of his annoying sales lines. Nothing of any essence or depth here, just one liners to for brainwashed pyramid marketers.